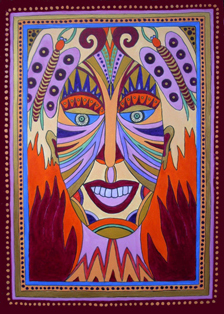 Liz is an Australian artist who draws and paints, and she also makes jewellery and masks. Her graphic work is done in Indian ink, coloured inks, acrylic paint or felt tipped pen on paper. She has been drawing for ages, while doing other things as well including lots of travelling. She is a University graduate, and has worked at many jobs including being a high school teacher (she's an economics graduate). After disillusionment with the teaching life, she became a silversmith, environmentalist and author, in addition to being an artist. 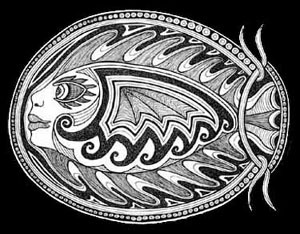 She has developed a unique style in her work, as this website shows. Liz lives and works at North Avoca (near Terrigal) NSW, which is a seaside town north of Sydney. For a picture of Liz, click here. In the art world, Liz's main claim to fame is having three works in the Collection de l'Art brut in Lausanne, Switzerland. The works were purchased in 1979, as the result of the recommendation of the late Jean Dubuffet. This came about when Liz became acquainted with Herbert Eckert, a life-time friend of Dubuffet's. Liz has regularly been called an outsider artist, but she's not at all like the stereotype - just shows that you can't always put people into boxes! However she conforms to the regular outsider label of being self-taught. When she has time, she prints some of her designs on cards, calendars and t-shirts using the brand-name Lazy Lizard. She sees the Internet as an alternative way to show her artwork. Click on the links below to view these pages. 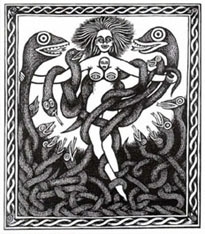 Some of Liz's snakes drawings appeared at Sydney's Callan Park Gallery in November 2009, at the Snake Exhibition, and this one is called The Snake Pit. Click here to see more of Liz's snake drawings. Go and see some photo's of the bushland surrounding Liz's home, and visit her genealogical interests at the Parkinson family website and the The Underwood page. Also check out the Lazy Lizard for the books she has written. Liz can be contacted by e-mail. 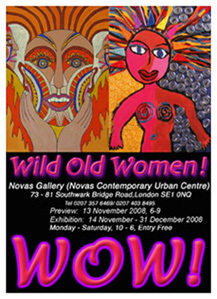 Liz's art appeared in the Wild Old Women (WOW) exhibition held in London from November 14 to December 31, 2008. The image on the left of the poster above is one of her artworks, while Sue Kreitzman's work appears on the right.